Dreyfus writes with admirable clarity and focus, possibly attributable to his fifteen years of intense and incessant study and debate at the Drepung Loseling monastery in Karnataka, which houses about 3000 monks. He was the first westerner to gain the title of Geshe, a degree taking at least 12 years to complete and which seems roughly the work equivalent of three PhDs. Dreyfus is resolutely anti-mystical. He shows little interest in the esoteric traditions of Buddhism, rightly wary of the Western appropriation of tantra and other “secret teachings.” He distrusts both the romanticization of foreign cultures as well as the polarized we-vs-them assessments that often substitute for genuine comparative engagement. Instead, Dreyfus focuses on Tibetan Buddhism’s dialectical investigation and debate into reality, knowledge, and being.1 He has written in more explicitly philosophical terms elsewhere, but his focus in the book is primarily on the monastic academic culture and their practices of learning and training, as well as the culture’s relation to its philosophy. By showing the importance of the life of the mind in this tradition, I present a picture of Buddhism that differs from standard representations. Instead of straining my ears to listen to the mystical sound of one hand clapping, I focus on practices such as debate, where the sound of two hands clapping can literally be heard loud and clear. In this way I make clear the important role played in Buddhism by the tradition’s rational and intellectual elements. These elements have often been misrepresented as precursors of scientiﬁc inquiry or rejected as clerical corruption of an originally pure message. 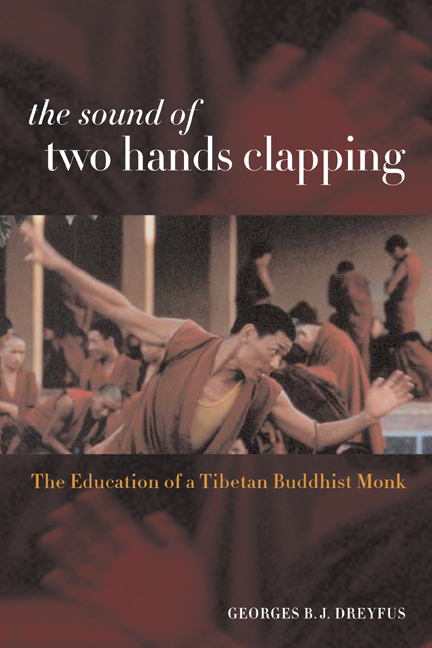 In The Sound of Two Hands Clapping, which examines the role and nature of rationality in Tibetan monastic education, I contend that each of these views seriously distorts the nature of rationality in traditional Buddhist cultures. My claim is not that Tibetan culture is uniquely spiritual or that monasticism is the only focus of intellectual life. Tibet also enjoys a secular culture with political institutions, literature, music, folklore, and so on. Moreover, there are traditional nonmonastic forms of education, both religious and secular, as we will see later. Nevertheless, it remains true that the sophisticated intellectual culture that developed in the large monastic institutions has been at the center of traditional Tibetan life for centuries. Hence, an examination of the ways in which Tibetan monks are educated can provide an important view of the depth and richness of Tibetan culture. It can also correct the excessive emphasis on the mystical and romantic that at times have been the focus of Western understanding of Tibetan culture. The construction of a universe of meaning is not unique to Tibetan scholastic traditions or to scholasticism in general. Most religious traditions, however, do not take the doctrinal and intellectualist approach adopted by scholasticism. Rather, they emphasize the role of myths and rituals in constructing a universe available to large groups. While these mythic dimensions obviously exist in scholastic traditions, they play a lesser role than abstract doctrines, which are used to reﬁne and develop the culturally accepted universe of meaning and reinforce the conviction of their participants. This, I suggest, is a distinguishing feature of scholasticism as a religious phenomenon that concerns the intellectual elites. I believe that these hardships played an important role in the life of these scholars. They created an atmosphere that led monks to develop new habits and stiﬂe old ones, particularly those antithetical to monasticism. Immersed in a life of singular intensity, scholars ignored the usual desires and redirected their attention to soteriological concerns. Hardships helped in this process, strengthening the scholars’ resolution and providing the pressure that effected their transformation. Discarding one’s hedonistic desires is never easy, but the task’s difﬁculty is magniﬁed when one is living in comfort, with pleasures readily available. To break away from such desires, it is helpful to enter a new situation from which those pleasures are absent. That is what monasticism is supposed to provide. But mere absence is not enough. The pressure of the milieu and the hardships encountered help break the hold that desires have on one’s mind, creating new patterns in which soteriology is central. Hermits report undergoing a similar experience. Their career often starts with great difﬁculties: they lack food, fall sick, experience mental problems, and so on. But once they overcome these difﬁculties, they progress quickly and easily. This pattern, equally clear in the life of many saints, suggests that those initial difﬁculties are not just obstacles but vital elements of the story. They create the kind of pressure under which inclinations can be reordered. After this transformation, the practice becomes easy, effortless, and intensely fulﬁlling. So, too, the great hardships and the intense discipline of Tibetan scholars push them toward the change in inclinations necessary to achieve their goal. This reordering is also greatly enhanced by the narrative unity that scholars ﬁnd in their existence. As I will show in chapter 8, providing such unity is one of the central tasks of scholastic education, which is often less a direct preparation to meditative practice than an intellectually rigorous framework in which Buddhist practice makes sense. Developing a meaningful narrative structure contributes powerfully to the effectiveness of the discipline. It conﬁrms the value of the tradition and justiﬁes its members in the sacriﬁces that they have made. It gives them a sense of purpose and achievement, encouraging a decisiveness and resolution that serve them well in their future religious and worldly endeavors. A monk at the Nam-gyel monastery expressed a typical view when I asked him why he was not meditating. Visibly becoming defensive, he said, “You Westerners are really quite funny. You all want to become a great meditator and become buddha in this life like Mi-la-re-pa. You think it’s easy. You do not realize how difﬁcult this is and how much sacriﬁce one must be ready to make. In Tibet, there were hundreds of thousands of monks, and one or two managed to achieve realization.” Many traditional Buddhists would agree with his reply. This stance is often combined with the cosmological vision of the degenerate nature of the times (snyigs dus), a view pervasive in most Buddhist traditions. Many of my teachers shared this outlook, arguing that our time is too degenerate to allow much spiritual development. One put it this way: “We are not strong enough to reach realization in this lifetime. But we can prepare ourselves so that when Maitreya [the next buddha] comes, we will be in good shape and become one of his chief disciples.” The traditional cosmology suggests that the wait will be rather long, and hence there seems to be no compelling reason to rush toward enlightenment. On the other hand, meditation-like practices in study are present in abundance in Ge-luk monastic life. Primary among them is rote memorization, the slow assimilation of texts until they are second nature. Texts–not just fundamental philosophical texts, but manuals of conduct–are learned eidetically rather than semantically. Texts are recited out loud many times until perfect recall is achieved. The young monk then proceeds to memorize the passage given to him the night before. He loudly reads it from his text bit by bit, rocking his body back and forth. He starts with the first word or two of the first sentence or line of a stanza (often but not always the text is written as poetry; the verses of seven, nine, or eleven syllables, grouped in four-line stanzas, are easier to retain than prose), reciting that element until he has mastered it. He then moves on incrementally until he has memorized the whole sentence, which he recites, still in a loud voice, several times. The same process is repeated for subsequent sentences; and after memorizing each, he recites the sentences that he has just memorized. Thus, by the end of the session, the whole passage forms a whole that can be integrated with the passages he has already memorized. The process of memorization is aural. Without relying on visual mnemonic devices, Tibetan monks memorize their texts by vocalizing them. The only support is a tune to which the words are set. In certain monasteries (such as Namgyel, where monks are expected to memorize an enormous amount of liturgical material), the text is memorized to the same tune to which it is later chanted. In scholastic monasteries or in smaller monasteries, there is no fixed tune. But in both cases, students concentrate entirely on the text’s sonic pattern, ignoring other associations as much as possible. Meaning is only examined after the sounds of the text have been internalized. By dissociating texts from meaning before committing them to memory, the monks seek to make memorization a form of implicit memory, ingraining texts in the mind as if they were a motor skill. By contrast, when we memorize a text that we already understand we rely mainly on semantic memory— easier to acquire but less stable. It is open to the retroactive interference of subsequent learnings, especially those having to do with the same subject. Without completely erasing the old memory, new ones take over and modify it in the light of new knowledge. Texts that we memorize without understanding their meaning are not so prone to reconstruction, because of the artiﬁciality of their inscription, which occurs in a mnemonic subsystem not inﬂuenced by semantic memory—hence, the practice of memorizing texts without understanding them. What comes with difﬁculty goes with difﬁculty. These important beneﬁts are not unlike those provided by meditative training, which is even more effective in giving its practitioner the ability to be attentive and concentrate, as well as the experience of mental calm. The advantage of memorization over meditation is that it is easier. In meditation, one’s mind focuses on purely internal objects (when it focuses at all), easily wandering off unnoticed for several minutes. In memorization, the mind is given a clearly deﬁned external task and kept to it by the loud vocalization and the tune that are part of the process. Hence, to memorize is a relatively painless way to acquire the stability and discipline essential to monastic training. This educational process reflects the belief that knowledge needs to be immediately accessible rather than merely available. For many reasons, this sort of memorization has suffered a huge decline in western culture over the last century (following a more gradual decline in the centuries before that), and the effects on cognitive structure and processing should not be underestimated. I have always been quite poor at rote memorization, while having a great talent for remembering organized structures–learning grammatical rules was always far easier than memorizing vocabulary. I retain conceptual abstractions rather than exact phrasings. So I suspect I generally do not process texts, even those I know well, in the way that Dreyfus describes here, and this is no doubt an deficiency on my part–though it has some concomitant advantages. Tibetan debates involve two parties: a defender (damchawa), who answers, and a questioner (riklampa). The roles of defender and questioner imply very different commitments, as Daniel Perdue explains: “The defender puts forth assertions for which he is held accountable. The challenger raises qualms to the defender’s assertions and is not subject to reprisal for the questions he raises.” The responsibility of the defender is to put forth a true thesis and to defend it. Hence, the defender is accountable for the truth of his assertions. The questioner, on the contrary, is responsible only for the questions he puts forth. His questions must be well-articulated, must logically follow from the points already made, and must be relevant to defeating the defender. Their truth content is irrelevant, however, for his task is not to establish a thesis but to oblige the defender to contradict either previous statements or common sense. Let us take the example of a debate about the definition of impermanence, which is “that which is momentary.” The debate starts by delineating the agreement between both parties. The questioner may ask for further clarification, with such questions as “What doesmoment mean in this definition?” “Does it refer to a brief moment or to a longer one?” The defender may answer that the moment implied by momentary is brief. The questioner then proceeds to draw consequences, thinking that he has enough to go on. He may start, “It follows that things last only for a short moment since they are momentary.” This statement is framed to embody the defender’s answer concerning the meaning of momentariness and is considered the root consequence (tsawé telgyur), which derives from the root thesis (tsawé damcha) that the defender must be made to contradict. The questioner’s task is then to oblige the defender to back off from his acceptance of the root statement, forcing him to make the no-pervasion answer that contradicts his main thesis. To do so, the questioner will draw unwanted consequences from the defender’s position, pushing him to make counterintuitive statements until he reaches the point of absurdity. Yet such intensity also can be dangerous. There are clear cases of monks using debate for the sole purpose of settling old scores or advancing their own ambitions. In twelve years of practicing debates, I have sometimes seen abuses committed. I have seen people attempting to wound and humiliate their adversaries or becoming genuinely angry. These cases are rare, however, and most debates reflect an honest interest in intellectual exchange. These debates seem most reminiscent of the early eristic Socratic dialogues (thought to be an Athenian pastime in Gilbert Ryle’s account), though with a more explicit, culturally agreed-upon set of rules. Competition and a clear sense of victory or defeat are explicitly employed to further study. My greatest disappointment in coming to an American university was the lack of debate. I remember at ﬁrst trying to debate in classes with other students or with the professor, but such attempts usually ended badly. In one class, I was told that debating was not what “gentlemen” should engage in. In another, the professor was only too delighted to debate me in his area of specialization, where he obviously had the upper hand, but this made the other students uncomfortable. “How can you be so harsh toward a student?” they asked him. “Oh, don’t worry. He is well trained. He can take it,” was the reply. As I have tried to make clear, the monastery allows for freer encounters. There nobody is offended at being defeated in debate or even made fun of. I ﬁnd this culture of disagreement too often missing in American higher education, where students and faculties are at times overly sensitive and preoccupied with their reputations. There is a tension at the heart of such philosophical debate within a tradition, which should be familiar to anyone who has studied in almost any philosophical school, from Christian Scholasticism to Midrash to analytic philosophy: the existence of unquestioned, agreed-upon foundational views allows for fervent and unfettered debate about consequent issues, but the foundation must remain untouched. (The higher stakes in Tibetan Buddhism emerge when Dreyfus tells of murders committed between competing schools.) For all the debate the inquiry is fundamentally more limited. The issue of a canon becomes crucial here, since there needs to be some selection of texts to memorize and debate, and the lack of consensus in our culture today no doubt contributes to an unwillingness to have students privilege any particular text with such obsessive attention and assimilation. This embedded and conﬁdent rationality also results from the constitutive role of the great texts of the tradition, which do not just inform but form ﬁelds of study. Because scholasticism proceeds by examining and, in the ﬁnal analysis, appropriating constitutive texts, the understanding that is derived from their studies remains embedded within the tradition. Scholastic reason can be used to critique certain aspects of the tradition but ﬁnds it difﬁcult to question the tradition as a whole, for it necessarily remains within the parameters determined by the basic texts. Such a procedure is strikingly different from modern scientiﬁc rationality, which is based on a readiness to cast aside previous theories in the light of new facts. Such readiness should of course not be exaggerated, as Thomas Kuhn has made clear in drawing a distinction between normal and revolutionary sciences; a good deal of science involves working within an established paradigm. Nevertheless, the scientiﬁc enterprise in principle is prepared to let go of past theories, to reject the familiar disciplinary matrix and shape a new one. The same is not true of scholasticism, which is inconceivable without the constitutive texts around which it revolves. Unlike great scientiﬁc texts, these are not held provisionally as a basis for problem solving. Although their exact interpretation may be up for grabs, there is nothing tentative in how scholasticism regards its great texts. They are the authority within their own domain and the given basis of the tradition, which evolves as scholars constantly reappropriate their content. As we have seen in previous chapters, this means not that such a tradition is uncritical but that its critical spirit remains within the orbit of the tradition delimited by the scholastic curriculum. I find this a significant point, since it unites the religious aspects of scholasticism with its scholarly methodology. The functional aspects of study as a method of training the mind are not, in the end, aimed at generating radically new knowledge, but in training the mind and reifying a fundamental substrate. There is value in the method apart from that goal, but the survival of the culture relies on a conservative and traditional closure to debate. The closure presupposed by tradition distinguishes rational scholastic practices from the practices of modern scholars. It would be a mistake, however, to assume that the boundedness of scholasticism necessarily implies a dogmatic and uncritical spirit. To ﬂourish, scholasticism needs freedom to interpret its own constitutive texts. In the Tibetan tradition, debate provides this freedom of inquiry, which allows scholars to examine rigorously the content of the tradition, though that examination is limited in its scope. Questions may be raised, but they may not undermine the foundations of the tradition, particularly its constitutive texts. In Tibetan scholasticism, when such limits are transgressed, authorities (secular or monastic) step in to restore what they perceive to be the integrity of the tradition, thus illustrating the reality and limits of this tradition’s freedom of inquiry. It is not coincidental that the most memorable and inspirational figure in the book is the teacher who most strongly pushes at the boundaries of what can be questioned. 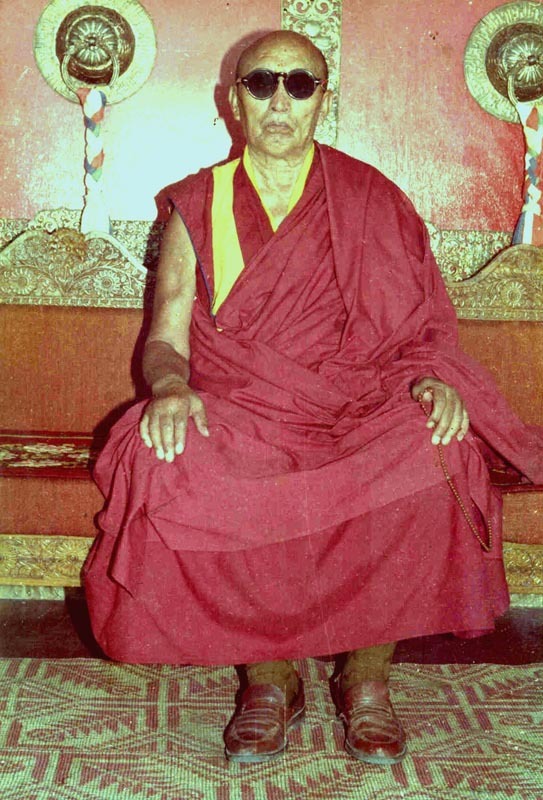 This teacher, whom Dreyfus clearly reveres and vividly describes, is his mentor Geshe Nyi-ma-gyel-tsen (Gen Nyi-ma for short, also called Gen-la (revered teacher) by Dreyfus). Gen-la’s appearance also reﬂected his approach to life, which he devoted entirely to intellectual and religious pursuits rather than to superﬁcial external reﬁnements. He often showed little concern for personal grooming and paid little attention to his robes. Often his students had to clean him up. His eyes were his most striking feature, however. Because his eyelids could not stay open on their own, he had to hold a ﬁnger to the side of his right eye. This, combined with his shortsighted peering, gave him a wrathful appearance that was, to say the least, not very attractive. The unpleasant impression would be heightened when Gen-la read: as he kept his two eyelids open with his two hands, his big red eyes would bulge out. Students would often comment that it had taken them several weeks to get used to Gen-la’s appearance and to be able to look at him. 19 But his inﬂuence on his students and their admiration for him were so strong that after some time students would completely forget their ﬁrst impression. Some students would even go as far as to unconsciously mimic Gen-la, putting their hands by their eyes. In accordance with his predilection for questioning and contrary to most teachers, Gen-la rarely commented on a text or explained a point but proceeded almost entirely through debates. He would pick up a term in the text and would start to explore its meaning; as he sat, he snapped his debates to students who were in charge of answering. The class would continue only as long as his students were able to answer. Most of the time, Gen-la was able to shoot down any answer put forth by his students. This was no small achievement, for his teachings often attracted seasoned scholars. Sometimes, however, students were able to answer Gen-la quite well and even put him in jeopardy. On those rare occasions students would stop, slightly embarrassed, as soon as it had become clear that they had established their points. They would then defer to Gen-la’s summary of the argument, but it was clear to everybody, Gen-la included, that they had won the argument. Following Gen-la’s classes was a treat for good scholars but quite difﬁcult for those with minds less well prepared. Gen-la considered himself a poor teacher. He was fond of quoting a student who had told him, “Gen-la, when I come to see you I think I have some understanding of the topic. After your class, I am completely confused and have lost the little I knew!” Gen-la viewed his classes not as channels for imparting some truth but as means to further the inquiry. Hence, his teachings were thrilling for those who could follow them, for they had the impression—quite rightly—of being taken on a search for greater understanding by one of the best minds of their time. But the classes could be very difﬁcult for those who had not yet gained the knowledge and experience required by his probing questions. Gen-la’s comment puts scholastic studies in their proper perspective. They are means to develop an insight into the nature of reality but are unable in and of themselves to bring to full maturity the process that they start. Gen-la understood and valued intellectual complexities, realizing that the Indian sources of the tradition have a diversity of views not easily exhausted by any party line. He also emphasized the deconstructive dimension of inquiry—the central insight of the Madhyamaka tradition, that reality is essenceless and hence no distinction can be completely consistently maintained. Yet he was quite aware of the potential risks of his approach. No relativist or nihilist, he held that the ability of the mind to undermine concepts must be at some point restricted. One day, he told me: “The inquiry has by itself no limit. One must decide for oneself what the limits are. For me, the limits are determined by Dzong-ka-ba and his direct disciples.” This statement was obviously an invitation—but it was also an admission that “reasonable people” (here teacher and student) could disagree, since there is no intrinsic essential property that can separate conﬂicting approaches. The point is not that no distinction can be made, but that such distinctions are fragile and that to remain within the circle of acceptable views one must recognize that fragility. I remember answering by mumbling something about the importance of the great Indian texts. For example, in the search for the view of emptiness, the other main goal of the scholastic training, deeper understanding is reached by the gradual cultivation and internalization of the Madhyamaka mode of inquiry through thinking and meditation. In this way, ordinary subjectivity, particularly our obsession with our own self-importance, is disrupted and we gain the ability to deal with things, ourselves included, without grasping onto them. This understanding is quite different from the purely intellectual approach developed by debate. Yet scholasticism also has deﬁnite strengths, for it fortiﬁes concentration, develops conﬁdence and resolution, and trains the mind in the art of inquiry, an ability without which deeper understanding is impossible. Thus, far from being an obstacle to higher religious pursuits, scholasticism is an important step toward appropriating the tradition. However, such an appropriation is constituted less by standard doctrinal formulations than by an inquisitive mind that can see through the limitations of its constructions and yet remain within the orbit of the tradition. The reasons for my preference for Gen Nyi-ma are not difﬁcult to ﬁnd; they have to do with my own background. Because I had been raised in an intellectual family, I found myself at ease with an approach based on realizing the complexities of the tradition. My response had little to do with my being a Westerner, however. Other Western students found his approach to Buddhism much less appealing. Some thought that it was a distraction from more essentially religious concerns such as meditation. Others became profoundly uncomfortable: they wanted certainties and were not ready to question fundamental concepts. One could even say that many Western Buddhists seem particularly lacking in their abilities to reﬂect on and problematize the basic concepts of their newly adopted tradition. Terms such as wisdom, path, and enlightenment are used as if their referents were perfectly self-evident. I particularly remember a Western friend of mine who would often question me about points of Buddhist doctrine. At ﬁrst, I would answer him by laying out the different opinions and the subjects of debate, but he would respond impatiently, “I am not asking for a list of possible opinions, I am asking for an answer.” I would then have to choose, more or less arbitrarily, what seemed to be the most appropriate answer and give it to him as the answer, keeping to myself the realization that this was just one interpretation among many. The ability to tolerate complexities is certainly not a Western birthright. It should be evident that I am with Dreyfus and Gen Nyi-ma. In comparison to Gen Nyi-ma’s searching approach, such people as Dreyfus’ friend should feel somewhat embarrassed. Thomas Frank: What’s the Matter with Kansas? Brett Bourbon: Finding a Replacement for the Soul, cont.